160km of canoeing, biking and trail running across the Oak Ridges Moraine. 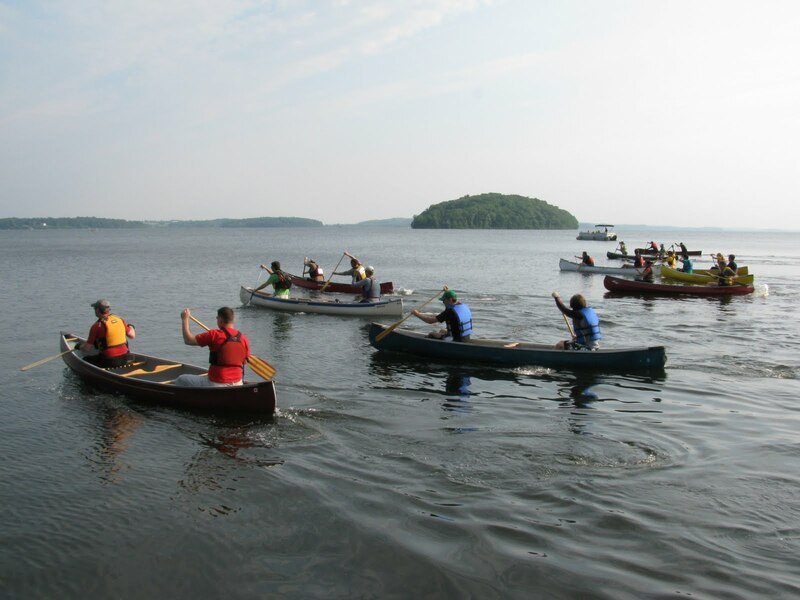 There are 14 stages, one canoe, the rest biking and running. You can assemble a team of anywhere from 2 to 15 people. The Trail Pythons - 8 of us took on from 1-3 stages each to take on the Moraine. Special thanks to Srijit for shooting the video and Boris for editing it so nicely! This was a big question mark for us, as none of us have spent much time in canoes. The goal was to get through it without sinking, which we accomplished! Not content with the distance of a straight line, our guys zig-zagged across for an extra challenge! They gave it everything, and muscled through some difficult windy conditions. This stage is mostly in Ganaraska Forest. I love almost everything about cycling, except sand - and this stage was sand pretty much from a few kilometers in to the finish. I was managing to keep a decent pace through most of it, until I hit this one downhill section. It seemed not to bad at the top, but once I got some speed I hit a deep sand rut... my front wheel dug in and I went flying over the handlebars. A little bloody and in pain, I got back on the bike and managed to finish off the stage with a bit of oomph... but it was a long tough stage. More Ganaraska Forest, more sand! Our guys fought valiantly through it, putting in great performances to get us through and out of the forest. I will update this description after I talk more to the guy who did it... he got a bit lost and I didn't have time to ask him about anything other than getting lost! What looks like a road on the map is often a barely passable forest trail. In the case of stage 6, a rocky, sandy, hilly "road". Stage 7 sounds like more of the same, very sandy and tricky at times. Stage 8 - Biking and finally, speed! A fast bike on mostly paved and gravel roads. Some people were even on road bikes! We will have to consider that for future years, this is probably a good way to make up some time. Nicely groomed wide forest trails - at last! This area is my home turf, and our runner did a great job flying through it. This was my only run stage, and it was pretty tough. 11km of trail running. And then the marsh. I was running along and saw what looked like a fairly big puddle of water covering the entire trail... but when I stepped into it my foot sank down into the muck and filled with water. The very next step I lost my shoe! Ankle-deep in the muck, I fished around and retrieved it, my socks were now black with marsh muck, it was pretty nasty. I managed to keep my time respectable, pretty close to my target pace, but once again a fairly tough stage. A shorter stage and lots of roads meant our guy could absolutely hammer it. In fact he was so fast, we missed him finishing! He reported nice groomed trails and fast road sections. Gorgeous groomed wide trails - welcome to York Regional Forest! No more marsh crossings, these trails are beautiful, and our runner did a great job (despite adding an extra 1.5km to the route by going the wrong way!). My last stage of the day and I was determined to hammer it. This stage was a mix of paved road and very wide and fast trails. It was starting to get dusky, especially in the woods, so a bit tricky to see at times. I put my trust in my bike and the trail and just went as fast as possible. Unfortunately, right at the end someone had moved one of the signs! It was pointing the exact opposite way of where it was supposed to be - clearly someone's stupid idea of a joke. That cost me about 5 minutes of going the wrong direction before I finally went back to my GPS and figured it out. A mix of road and trails, which in the dark was difficult. But our guy did a smashing job and brought it home, completing a very very long day! The results are still being calculated, but I think we did pretty OK for our first go at it. We learned a few things about navigation, equipment, and preparation. If we take it on again, I think we'll be able to improve our finishing time significantly! The toughest part of the race was the organization - pulling a team together, getting everyone to their start points, learning the stages, food, drink, etc. We have worked on it for months, and in the end it went without a hitch. The race itself was just awesome. The volunteers were exceptional and very pleasant. The course was remarkably well marked, considering it spanned 160km! I was very happy with everyone I dealt with and I think they pulled off a wonderful event. I'm a little too sore and exhausted to think about next year right now, but I suspect we'll be back... we have unfinished business! I am game for a second round next year. And hopefully we wont be zig-zaging through the canoe stage. Ha ha... well like anything, the canoe takes practice and training to do it well! :) I'm sure we can get faster without too many changes, we probably lost 1/2 hour getting lost alone. Dude, don't sweat it! :) It was our first year, it's for learning the race and what it was all about. We'll smoke it next year. Congrats Jono & Team, great job. I had to pass on your call for participants this year as I was committed to Grandma's Marathon same weekend. But if any of your team opts on for next year, I'd be happy to be a participant. Great Dave! I'll see how it shapes up when we start planning 2011. Life's a Beach... Biking in Deep Sand is NOT!